Project Gumby started out as a 1996 Jeep Cherokee Classic. This customer bought the Cherokee to be a wheeler and after about 5 years of trail riding the stock front Dana 30 and rear Ford 8.8 had enough. In February of 2007 after an extremely bad weekend at Grayrock ORV Park in Mt Olive, Alabama, it was determined that front and rear Dana 60s were destined for the Cherokee. In September, 2007, after finding a front reverse cut Dana 60 and a rear Dana 60 from a 1979 F350 the existing Cherokee axles were removed and the 60’s were rolled under the Cherokee. This was the beginning of a new trail for the Cherokee and the beginning of what has come to be known as Project Gumby. Project Gumby was destined to be different from the beginning. The owner had chosen axles, tires, and rims, but the suspension and wheelbase were in the air. The 38” TSL tires were mounted to Pro Comp Rock Crawler steel wheels. The steel wheels were fitted with DIY bead-locks with a 3.75” backspacing. Once the tires and axles were under the jeep, it was obvious that the wheelbase had to be extended. Cutting the sheet metal, a comp cut, just to create space was not an option to the owner, so we decided to move stock wheel opening toward the rear of the Jeep. It just so happened that XRR was involved with project Smokey, a 79 CJ that turned into a 79 CXYJ. The owner of the 79 CJ had acquired an 89 XJ and robbed the head and other fuel injected related items for the stock AMC 258 that came in the 79 CJ. After all of the fuel injection items were removed the 89 XJ was bought as a sheet-metal donor for project Gumby. To keep the center of gravity as low as possible, the rear axle was moved back to the point where the front of the rear tire cleared the body just behind the rear doors at full compression. To accomplish the stretch, a main leaf from a Jeep Comanche was selected since its center pin is about 3” off-center (toward the rear) and it is also a slightly longer leaf spring as compared to the original Cherokee spring. In addition to using the Comanche main leafs, the custom spring pads for the rear Dana 60 were drilled about an inch off center. Since we had a sheet-metal donor it was decided that most of the rear quarter would be removed and that the donor sheet-metal would be used to keep the original look of the Cherokee, giving the Cherokee a full body look instead of the "comp" look. By doing this we widened the wheel well approximately 6”. The gas cap on the Cherokee’s original sheet-metal was located just behind the driver rear wheel. When the wheel well was widened we lost use of the original gas filler location. This was resolved by using a Jeep TJ filler which was re-plumbed to utilize the original fuel tank. The fuel tank was also moved to the rear approximately 3” to allow clearance for the differential at full compression. The original shackles on the rear suspension were almost horizontal when used with the longer Comanche leaf springs. A custom shackle relocation bracket, designed by Extreme Roc Rigs was used to compensate for the longer leafs. The XJ shackle relocation bracket uses the OEM shackle bolt along with mounting holes found within the frame making it a complete bolt on part. Gumby’s finished wheelbase is 106”, approximately 5” longer than stock. The front suspension on Gumby is a one-off three link design using 2-1/2”OD ¼”wall DOM for the main link and 2”OD 1/8” wall DOM for the upper link. The links are connected to the Jeep via a custom transfer case skid plate made from ¼” steel plate that sets flush with the bottom of the uni-body. Extreme Roc Rigs fitted both axles with 5.39 gears. The front gears ride on an ARB air locker while the rear axle was made to be a “Lincoln Locker”. Both differential covers were reinforced with ¼ steel to protect the ring gear from any close encounters of the granite kind. The front stub shafts were replaced with 35 spline units and connected to the stock 35 spline inner shaft via a Dana Spicer U-joint. 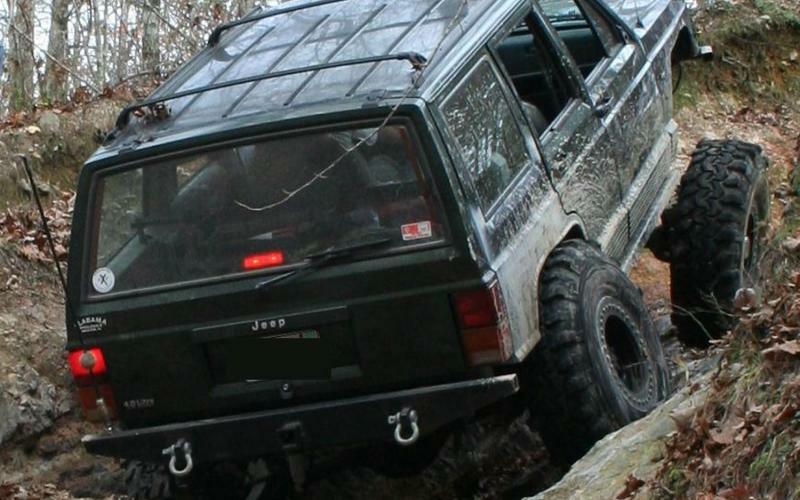 Warn Premium locking hubs were used to keep the wheels locked to the ARB locker. Initial testing of the suspension was performed by using a forklift to simulate compression scenarios. Cycling the suspension allowed us to see if anything was binding and also allow us to properly fit the axles with the correct length shock. Adjustments were made between cycles to dial in the suspension. During the 2008 Toy 4 Tots ride at Grayrock ORV the once mildly modified Cherokee was reunited with the off-road park and began its life as Gumby. Gumby performed flawlessly on its maiden run and has been on several rides which have provided many opportunities for fine tuning in real-world use. Since its maiden voyage Gumby has been fitted with 1-1/2” wheel spacers on the rear as well as a rear disc brake conversion and PSC Motorsports full hydro steering.